That day was a Psalm 42 kind of day. It was as hot and as humid as a North Carolina summer day could be and I had a yearning to be cool and comfortable. I had a longing to walk through the woods, on my grandfather’s farm, where the shade of the trees would offer relief from the stickiness and heat of the day. I wanted to put my toes in the cool, clear water of the creek and sit on my favorite rock while dangling my feet in the water that encircled it. I loved the quiet, the cool breezes, the sounds of the creek and the woods. This place was my favorite place and spoke to the quiet longings of my heart, even before I could name them. Holy, holy, holy. There was just one problem. I had been forbidden to wander through the woods without anyone with me, but not having anyone with me was part of my longing! I knew the way. I knew the path. It wasn’t far. I could do it. So, I did. I could hear the creek before I could see it, because creeks sing like that and before me stretched a beautiful, quiet afternoon by myself at the cool creek. I don’t know how long I stayed there, but after some time I knew that I had to get back to the farmhouse, because, after all, no one knew where I was. I climbed out of the creek and made my way up the bank and under the fence and down the tractor road that ran by the wheat field. I felt deeply satisfied and I was happy. I got to a gate and suddenly I realized that I had not past a gate on my way to the creek. I was lost. I was afraid. I was in despair. Nothing looked familiar, but I kept going, still afraid. Faintly, I heard cows mooing. I kept going to toward the sound and then, I saw them. Our cows! They were standing in the midst of the barnyard. Our barnyard. I knew where I was, no longer lost. I knew what I had done. I had gotten out of the creek on the opposite side from the way I came. Psalm 42 is about yearning and longing and despair. Probably written after the time of David, the psalmist was likely a part of the Babylonian exile and, no doubt, was longing to worship God in the temple. The words and images of this psalm reveal that the poet had a deep and profound relationship with God. The poet longs to be with God, to worship God, to pray to God, to be comforted by God, and to be a part of the procession that sings its way to the temple. Have you ever been in deep longing for God? Maybe because of despair or fear, in need of comfort or lost? Maybe because you are not where you call home? On Easter Sunday, in 387 CE, a man was baptized at dawn by the one who was to become known as St. Ambrose. This man, 33 years old, had been raised in a Christian school, but was reluctant to accept the faith. He became a teacher, yet the teaching did not bring him satisfaction. He tried different teaching positions, in different places. Still, he was restless. He was yearning. And he felt the Holy One longing for him. Encountering St. Ambrose changed his life and brought him into a desire to study the scriptures. He examined his life and found his way to the baptismal font early on that Easter morning. And there, St. Ambrose baptized Augustine—a man who would himself be called a saint. The psalmist, the one in exile, understood what St. Augustine wrote about centuries later—that God longs for us and we long for God. Down across the ages countless men, women and children have understood God’s longing for us and our longing for God and yet, often we seek to satisfy this longing with other options. Often, we fill our lives to the brim with noble causes, or with acquiring more and more. We fill our lives with poor options as well, options that are harmful and destructive. We try and try and try to find ways to satisfy the longing that we have inside, but the longing that we have is in connection with the longing that God has for us. And our hearts are restless until we find our home in the heart of God. And often it is despair that reveals to us our longing for God and God’s longing for us. At the thunder of your cataracts. This verse has always intrigued me. The image of deep calling to deep is one of those images that can’t be reproduced creatively without some mystery about it. 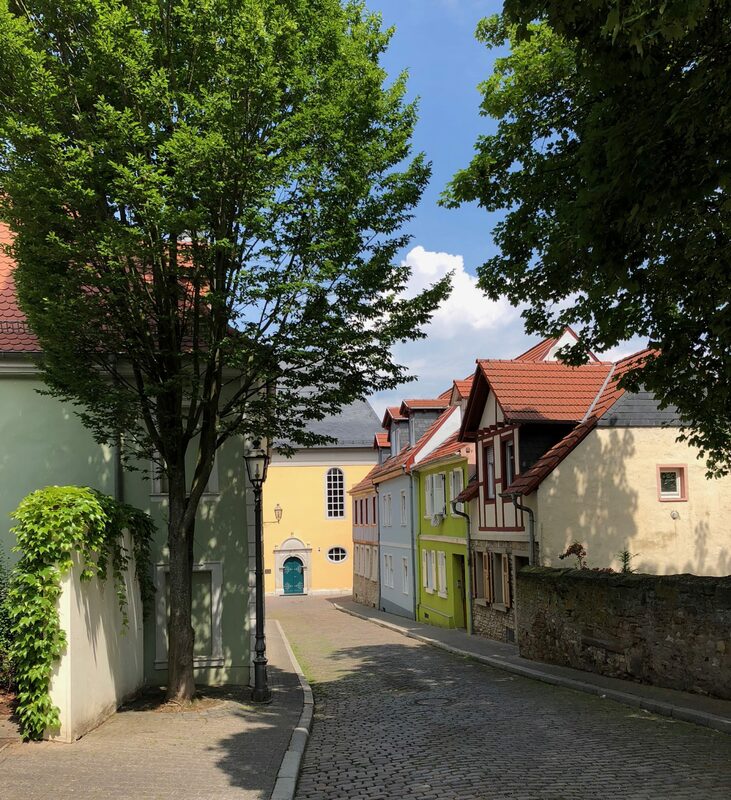 This mystery has traveled with me recently as I spent time this past spring in my ancestral home, following the despair and longing of my ancestors as they made a difficult decision to become refugees and leave Germany. The despair that my ancestors felt developed through a couple of generations over a period of a hundred years or so when war, famine, plague, and more war descended upon the family and their neighbors and friends and left their land and livelihood destroyed. The last straw came in the winter of 1708-1709 when the weather was so harsh that everything froze, including my ancestor’s vineyards and fortunes. There was nothing. The prospect of starving was real. They left Germany—penniless, impoverished, starving, refugees. They were beaten down. They were tired. They were in despair, longing for comfort and hope. They took boats up the Rhein River, that wide beautiful river that flows out of Germany and into the Netherlands; that wide beautiful river where small towns line the banks, present then and present now; that wide beautiful river where castles, still, overlook boats from perches high upon the hills. They made it out of Germany, out of the Netherlands, into England where they lived in Refugee camps and finally they sailed to New York in June 1710. All through the sea voyage they were in despair and longed for comfort and hope and God. They sailed across the Atlantic in ships that were too small, with little fresh water, with little sanitation, with little food. Two of my ancestor’s children died and they were left in deep pain and grief. Then one day these refugees were in New York, on the banks of the Hudson River—a river that called to them—deep calling to deep. The longing of God spoke to their longing for God. They followed that longing and comfort and hope, despite their pain and despair, to a place they called West Camp, grateful that they were safe. One of the first things this group did, despite their despair and uncertainty, was to organize and build a church and a congregation still meets for worship each week on that spot, 308 years later. My refugee ancestors knew that deep calls to deep, through the thunder of God’s voice, through the whisper of God’s voice, through the song that God sings in our hearts, when we are the most disquieted, when we listen. There is a monument that is there on that spot. It is a large stone with a plaque of names—three hundred German last names. And my ancestors’ names are there, across the ages, across the years, across the oceans, deep calls to deep. What this psalm teaches us is that we know and articulate hope and despair simultaneously. This is the reality of the world we live in. There are always those in despair, those who need comforted, reassured—those who need hope. Even Jesus knew despair and disquiet in his soul and so will we. But here is good news: even as we will experience despair and disquiet in our souls, we can also experience the steadfast love and faithfulness of God, who is always calling us and always leading us back to the very heart of God.